I'm a sucker for photos of Walt Disney with children and animals. 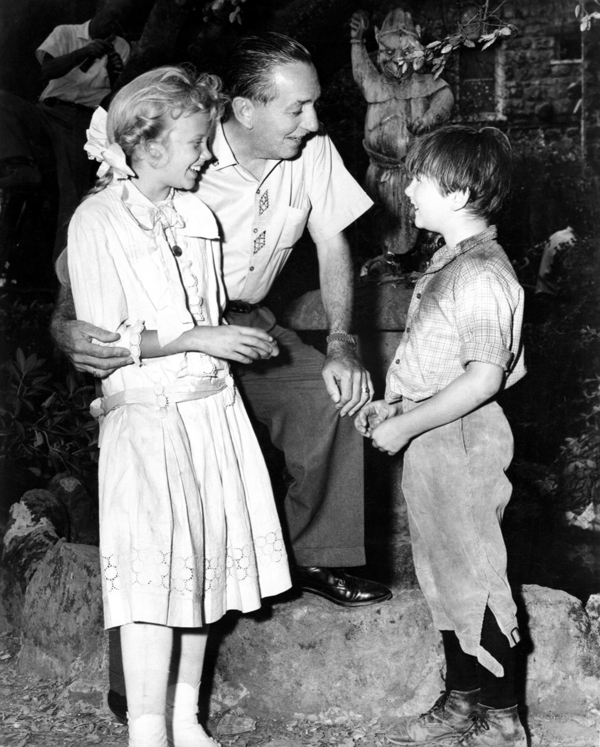 Walt always seems to be enjoying himself, as in this picture taken during the filming of Pollyanna (1960), with its young stars Hayley Mills and Kevin Corocoran. And then there were the introductions to the weekly Disney TV show when Walt was filmed with adorable animals—as with his toy poodle, Lady, for the 1957 show called "The Best Doggoned Dog in the World," and with four luxuriously fuzzy cats for a 1965 showing of The Three Lives of Thomasina. In every case Walt looks relaxed and very happy to be in the company of kids or animals (and the kids and animals seem to like him, too). In watching Walt, I'm often conscious of the tremendous gap between the rather small, intensely personal company that he commanded and the gargantuan Walt Disney Company of today. It can be stressful to deal with that very large company. I sought its permission to reproduce ten copyrighted illustrations (one photo and nine excerpts from Carl Barks stories) in my new book Funnybooks: The Improbable Glories of the Best American Comic Books. That permission ultimately was granted, for a reasonable fee, but the process took longer, and was more difficult, than my negotiations with other copyright holders. I feared for months that I would have to do without any Barks in the book, a chilling thought. The delays and complications were mostly a consequence, I think, not of anything to do with my request, but of the company's size and the demands its size imposes. Asking a huge company to act expeditiously is like asking an elephant to tap dance. In fact, the outcome might not have been as happy for me if my dealings with today's Disney were as "personal" as some of my dealings with the much smaller Disney of a few decades ago. I recall getting turndowns then, some rather brusque, from people I'd met and even knew on a first-name basis. Today's Disney is much larger and more bureaucratic, but it actually may not be quite bureaucratic enough. The point of a well-conceived bureaucracy, we often forget, is not to create an obstacle course for ordinary people but to reduce the arbitrariness we encounter in our dealings with large, powerful organizations, the Walt Disney Company being one such. Filling out those forms, answering those questions, paying those fees—it's all, or should be, a way to manage encounters between an organization and its supplicants to the benefit of everyone involved. I've often wondered, when contemplating my own experiences with Disney, and the experiences of other people, whether anyone at the company has given serious thought to exactly what is to be accomplished in responding to requests like mine, that is, requests from people who are not in some sense Disney employees. To me, the answer seems obvious: the Disney cartoons and Carl Barks's comic-book stories, to cite only Disney products I particularly care about, are important parts of American culture, and it's to everyone's benefit if people watch them, read them, think about them, and talk about them. Books like mine contribute to that discussion, on however small a scale. But is that the way that people in the company think, or are requests like mine a nuisance that's tolerated for reasons no one has articulated? I really have no idea. I've written in the past of Andreas Deja and Glen Keane as two latterday Disney animators (both have now left the studio) whose best work can withstand comparison with that of animators from the studio's "golden age." I know of no reason to alter that judgment, but I've been baffled by a couple of recent developments. 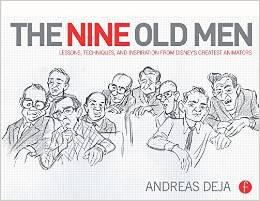 Deja has written a book called The Nine Old Men: Lessons, Techniques, and Inspiration from Disney's Greatest Animators; it will be published next February by Focal Press. My problems begin with the title. Disney's Greatest Animators? Really? So, John Lounsbery and Les Clark were greater than Bill Tytla and Fred Moore and Ham Luske and Art Babbitt, to name just a few? If, unlike me, you don't have trouble with the whole beaten-to-death Nine Old Men idea, there's still the fact that this book will be appearing in the wake of John Canemaker's very large and very thorough 2001 book on the Nine Olds, not to mention Frank Thomas and Ollie Johnston's Disney Animation: The Illusion of Life (1981). Frank and Ollie wrote other books about Disney animation after their first, and those books were very thin gruel. What is there left to say on this subject, except to chant what has become a secular liturgy about how unutterably wonderful the Nine Olds were? I guess we'll just have to read the book to find out. 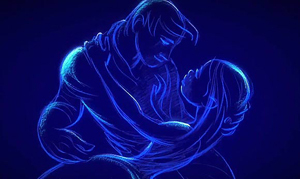 Glen Keane's post-Disney work has included, most recently and most notably, a very short short (less than four minutes) called Duet, a compressed love story presented through hand-drawn white lines over deep blue. As Amid Amidi reported on Cartoon Brew last June, "The short is the third in Google’s series of Spotlight Stories that are designed to explore the possibilities of interactive animation on mobile devices." As the characters move on your smartphone's screen, you will have to move your phone to keep up with them. The idea, I suppose, is to stretch the boundaries of a smartphone's four- or five-inch screen. If you're moving the phone around to follow the characters, the space they occupy will seem larger than it would if the screen were static. Regardless, what I found dismaying about Duet was not the technology, but the short's gauzy, retrograde feeling. It reminded me of nothing so much as the Disney package features of the mid-1940s, and the simpering prettiness of several segments in Make Mine Music in particular. Keane's animation, like so much Disney animation of recent decades, is essentially naturalistic, but in Duet it's in the service of ideas that resist that label. For instance, the two babies seen in the opening moments lack genitalia, and that lack is much more conspicuous than any sketchily suggested privates might have been (I kept feeling the urge to look away from what wasn't there). And is that supposed to be the same frisky dog throughout the short, which covers, what, sixteen years or more, longer than most dogs live? After several viewings I can't shake off such petty reservations about Duet. Rather, they grow stronger. Here again, I simply don't understand what a fine animator is up to. While the short may in itself have faults, personally I don’t find them as distasteful as you. However, I have a 7-year-old girl that I’m watching grow with leaps and bounds before my eyes, so I’m a little more "in the moment," admittedly. I believe the "point," if you will, was to see if there is a more natural transition in using hand-drawn animation to start with and transitioning that to a digital post- and final-production world vice the often "hard" and "straight" animation style that comes through in 100 percent CG-rendered movies. In theory, such a capability would allow for the benefits of hand-drawn upfront, but with digital post-production on the back without losing the more nuanced finish of a traditional animated film. In a CG movie, nothing is organic. Everything is hard first and then "fuzzed" or "defocused" afterwards into fur, etc. etc. Traditional animation, at least to me, is almost the exact opposite. Rarely hard first, but more nuanced and light and then drawn in "hard" later (save maybe some of the roughs you’ve shown here by the likes of Norm Ferguson. His style was hard (i.e. drawn in very heavy) but yet still very loose, where other animators tend to be more light at first and then darken in their final lines. Anyhow, who knows if anything will come of it (and they really didn’t address the "why" in the Making Of short, either). Sometimes Google can be odd in what they do without a lot of plans on where to take it. And I’m not holding my breath that anyone will run out and build a new pipeline for a future animated movie based on the technology, even though they probably could. From Ralph Daniel: You mentioned in your latest post that Andreas Deja and Glen Keane had left the company. Although I was aware of that, I am assuming that it was under favorable circumstances, like retirement. Since line-drawn animation now seems to be extinct (there's no way some scenes in Frozen could have been hand-drawn, even with a thousand animators given ten years), are there any such artists left at the studio? MB replies: I have no "inside dope"—I rely on Cartoon Brew, like everyone else—but as far as I know only a handful of traditional animators survived last year's purge. The survivors mentioned then were Mark Henn and Eric Goldberg, and I have no idea if they're still on Disney's payroll. Henn was involved in Frozen, I know, but his role as I've seen it described does not sound like that of an animator in the usual sense; rather, he was on hand to make sketches intended to show Frozen's animators how to add some of hand-drawn animation's vitality to computer-generated characters. Dana writes: "Copies of Duckburg Times issues 14 through 24/25 (except 22) are now being sold by me on eBay. This is from the stock of back issues I have had all these years. My brother kindly is handling the sales and since we started selling them earlier this year we have had fairly steady sales. I've been doing what I can to let comics, animation and Carl Barks fans know that these are available and at reasonable rates ($5 per issue, with double issues #17/18 and #24/25 going for $7 each). Getting these into the hands of people who appreciate the works of Walt Disney and Carl Barks is something that makes me very happy." To see what's available, go to ebay.com and enter "duckburg times" in the search field.